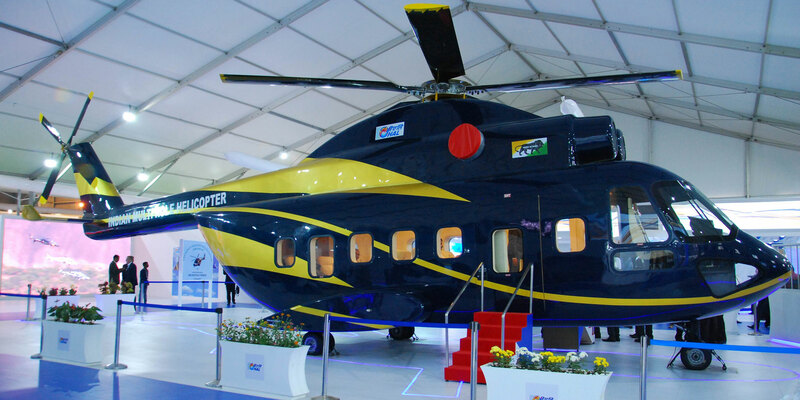 Hindustan Aeronautics Ltd. (HAL) has launched an Indian multirole helicopter (IMRH) program by displaying a full-scale mockup at the Aero India show in Bangalore. The IMRH is being designed to fulfill a long list of missions and could replace India’s large fleet of Mil Mi-8/17s, as well as some naval helicopters. The company did not indicate a timescale for development, flight trials and production. HAL previously stated (on its website) that it was seeking a partnership with an international helicopter manufacturer for the IMRH, to shorten the development time frame. HAL said that the twin-engine IMRH would be in the 12-ton class IMRH with a service ceiling of approximately 20,000 feet, a payload of 3,500 kg and a seating capacity of 24. It will be equipped with an automatic flight control system (AFCS), mission systems and advanced cockpit displays. “The Indian Air Force version will have a significant hovering and payload capacity at higher altitudes,” said T. Suvarna Raju, chairman and managing director of HAL. The company said that it has “not yet identified” the powerplants for the IMRH. India is one of the world's largest operators of helicopters with approximately 140 in its inventory, and continues to acquire more. Clearance has been given for the purchase of 48 Mi-17V5s by the Indian Defence Acquisition Council (DAC) headed by defense minister Manohar Parrikar. At Aero India, Bangalore-based Alpha Design Technologies announced a $30 million contract with Elbit Systems of Israel to upgrade the Indian Air Force’s 90 Mi-17 helicopters. Alpha Design, as the major offset partner, will manufacture key sub-units including smart cockpit displays, transponder, digital voice recorder (DVR), missile launch detection systems (MILDS), cables and brackets.